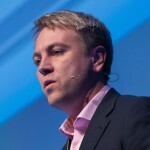 Mark Orsborn currently leads the Salesforce IoT strategy across EMEA. His prior role at Salesforce was within their global business transformation group working with CxO’s at large strategic customers to re-imagine their future. Over the last 18 years Mark has also held a number of operational and professional services technology roles at companies including CSC and 3M. He has consulted with clients in many industries including manufacturing, healthcare, utilities about how technology can enable business change. Mark holds a bachelor degree with honors in Aeronautical Engineering from Loughborough University in the UK.